The Pug temperament is often described as bubbly and bursting with energy at the seams. As you get to know the Pug temperament and personality, you will surely be amazed by how much personality is packed into such a small bundle. Of course, all Pugs will have some individual differences, but let’s take a closer look at some common Pug traits and Pug behaviors. The sociable Pug temperament makes this breed an ideal household companion. Pugs are often seen following their master as if they are on an invisible leash. A Pug likes to be treated as part of the family. They can easily know their place in the hierarchy of the pack. They can charm their way into your heart and blossom with plenty of attention. Pugs are not happy being left alone for long periods or being relegated to the backyard. When you have to leave your Pug alone, be sure to provide plenty of toys and enrichment to keep him occupied. Leave him in a comfy room of the house where he will have access to water. Pugs are extremely sensitive to heat, so never leave your Pug alone outdoors. Pugs can be stubborn but they are not aggressive. They possess an independent streak and can easily get bored with repetitive activity particularly during training. When bored, they can easily break up your training session with distracting antics to shake off the boredom. The stubborn Pug temperament can make training a pug quite difficult at times. You will need to have patience and a good sense of humor to be successful with some of the Pug temperament traits. Because of their short stature and adorable face, a Pug’s owner often has the tendency to unintentionally encourage undesirable behavior by laughing at their pet’s antics particularly during training. The best way to deal with Pug temperament is to be stoic and never be swayed by those big soulful eyes. Even though they are cute and endearing, do not allow Pugs to get away with naughty behavior such as begging at the table or barking for attention. Ignore unwanted behavior and reward polite behavior in the house. The lovable pug lives to please its owners. With tons of patience and regularity, you will be able to train your pug successfully. Don’t forget to shower loads of praise and lots of treats during training. This will certainly make them attentive and eager to learn. The secret to Pug training success is always motivation. These strong-willed dogs need something that can motivate them. Start training as early as possible to be sure that you are working on a blank slate before your Pug has developed negative behaviors. When house training your Pug, remember that most of them can completely control their bladder and bowel at about 6 months old. There are some Pug owners who don’t know this and become concerned when their puppies are difficult to house train. Never use harsh punishment or force-based methods to train your Pug. If possible, find a local trainer who uses positive reinforcement training methods and enrolls in an obedience class. It will be fun for you and your Pug! Pugs spend a considerable portion of their day sleeping. They are rather lazy and do not really require loads of physical activity to stay in shape. Too much physical exertion can aggravate the tendency of a pug to experience wheezing. A romp in the yard or a walk around your neighborhood is already sufficient for your dog’s exercise needs. During hot summer days, you can even exercise your Pug indoors by playing a game of fetch or tug in the house. Pugs love to hear their own vocal renditions and spend a considerable portion of their time yapping, snorting or barking. However, this behavior can be corrected with early and consistent training. Training your Pug to know when barking is legitimate can help make your pet an excellent watchdog. The attentive Pug temperament can make him a good little alarm system. Since Pugs naturally crave attention, they can develop separation anxiety when left alone for long periods of time. Changes in Pug temperament have been observed in pets whose owners work long hours. When they feel that they don’t get the attention that they need, Pugs will howl to let you know that they’re not pleased being left alone or feel they lack attention. If your Pug suffers from severe separation anxiety, consult with your veterinarian and a professional trainer. A pug loves food as if there is no tomorrow. They use all their talents just to get as much food as possible. Thus, they aim to look cute and even try to sway your indifference by looking at you with big soulful eyes. When you feel sorry for them, you will become “jelly in their hands” and they will manipulate you and take advantage of your vulnerability. When it comes to food, Pugs will certainly pull all plugs just to get another serving. They are very good at convincing their owners to give them more food. However, you should never give in because when your Pug realizes that you can easily be won over, he will never stop at anything to milk that weakness for all it is worth. One good point to keep in mind so you can keep your willpower is to remember that an overfeeding can increase the chances of having an overweight Pug and consequently increasing the risk of health problems. Pugs are generally quite friendly and easy going with other dogs. As with all dogs, it is critical to socialize your Pug from an early age. Enroll your Pug in a puppy socialization class with a positive reinforcement trainer. If you acquire your Pug as an adult dog, you can still acclimate him to other dogs using lots of praise and positive reinforcement. Pugs can also live peacefully with cats with proper training and socialization. Pugs can make wonderful companions for gentle, respectful children. They are fun-loving little dogs who enjoy playing with kids. However, it is important to supervise interactions between children and any breed of dog. Make sure to teach your children calm, positive ways to interact with the family pets. Although there are some exceptions, in general, the docile Pug temperament makes this breed a good match for families with children. Pugs have a very distinct appearance. They are short, squat and stocky. The typical Pug weight range is between 14 lbs and 18 lbs. Males tend to be larger than females. The normal Pug height range is between 10 inches and 13 inches. There are two main Pug colors: solid black, or fawn with a black mask. A Pug should have a “pug nose” (i.e. a very short snout). They also have very tightly curled tails. When it comes to grooming, you are in luck with this breed. The Pug has a very low maintenance coat. Their fur is short and smooth. It requires occasional bathing and brushing, but nothing fancy. You will also need to trim their toenails, clean their ears, and brush their teeth from time to time. The Pug breed is prone to some genetic health conditions. Please discuss these with your veterinarian before you decide if this breed is right for you. As with all dogs, it is important to find a veterinarian that you trust and bring your Pug for an appointment every year. It is also crucial for your Pug to be on flea, heartworm and tick prevention at all times. Spaying and neutering is highly encouraged for health reasons, behavior reasons, and to prevent further overpopulation of pets in this country. With excellent care, the average Pug lifespan is between 13 and 15 years. The Pug is a very ancient breed. These little dogs originated in China more than 2,000 years ago. Dutch traders eventually brought a few specimens of the breed to Europe. The breed quickly gained popularity among the monarchs of England. The American Kennel Club recognized the Pug as part of the Toy Group in 1885. If you would like to bring a Pug into your family, please think adoption first! There are already many homeless animals in this country looking for loving homes. 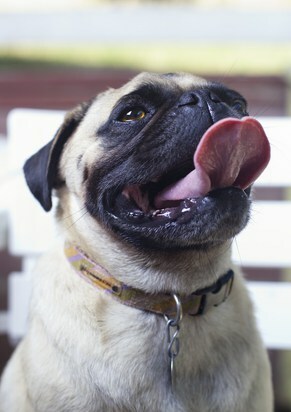 You can search for a Pug for adoption using websites such as Petfinder.com, Adoptapet.com, and Getyourpet.com. You can also search for Pug rescue groups on Facebook and Google. Rescue groups are animal rescue organizations that specialize in one specific breed. There are Pug rescues located throughout the country. You can also pay a visit to your local animal shelter or humane society. Let the staff know that you are looking to adopt a Pug and ask to leave an application on file for the future. If you are open to a Pug mix, you may find a match even sooner. If you acquire your Pug through a rescue group or an adoption center, the Pug adoption fee will probably be between $75 and $300 depending on the organization. This adoption fee usually includes spaying, neutering, vaccinations, heartworm test, microchip, and sometimes other vetting as well. If you decide to purchase a Pug puppy, take your time to find one from a responsible Pug breeder. Never purchase Pug puppies (or any puppies) through the internet or through a pet store. It might seem easy and convenient, but these puppies usually come from puppy mills and backyard breeders. Puppy mills are unscrupulous breeding operations that churn out puppies for profit. They do not care about the health or temperament of the puppies. They usually keep the breeding mothers in inhumane conditions. If you acquire your puppy from a puppy mill, you will likely end up with a puppy that is riddled with health problems. Instead, reach out to the Pug Dog Club of America and ask for referrals for responsible Pug breeders in your area. Once you locate a possible breeder, ask to make an appointment to visit the breeder’s location in person. Make sure the dogs on the premises are healthy and friendly. Ask to see their medical records. The breeder will probably have a list of questions for you as well. Good breeders want to make sure that their puppies go to excellent homes. A responsible breeder will ask you to get your pup spayed or neutered at the appropriate age. They will also ask you to return the puppy to them if things do not work out. When you purchase through a high-quality breeder, the Pug price tag will probably be between $800 and $1500 depending on the breeder. Some bloodlines will be even more expensive. Pug temperament can simply be summed up in two words “live wire”. Although they are known to spend a considerable portion of their day sleeping, once they are awake, they will make you laugh with their antics. They may easily wheeze when engaging in too much physical activity but this doesn't stop them going for romps in the yard or playing with kids and other dogs in the household. They have lots of growing up to do and even when they’re already two years old, your will still have one rambunctious puppy-dog on your hand. In fact, most Pugs only start to mellow when they are around five years old! The charming Pug temperament makes this breed a wildly popular pet in American households!